This article is about sovereign states governed by Communist parties. For the social movement and political ideology, see Communism. For the hypothetical social stage proposed by Marxist theory, see Communist society. There have been several instances of Communist states with functioning political participation processes involving several other non-party organisations, such as trade unions, factory committees and direct democratic participation. The term "Communist state" is used by Western historians, political scientists and media to refer to these countries. However, contrary to Western usage, these states do not describe themselves as "communist" nor do they claim to have achieved communism—they refer to themselves as Socialist or Workers' states that are in the process of constructing socialism. Communist states are typically administered by a single, centralised party apparatus, although some provide the impression of multiple political parties but these are all solely in control by that centralised party. These parties usually are Marxist–Leninist or some variation thereof (including Maoism in China), with the official aim of achieving socialism and progressing toward a communist society. These states are usually termed by Marxists as dictatorships of the proletariat, or dictatorships of the working class, whereby the working class is the ruling class of the country in contrast to capitalism, whereby the bourgeoisie is the ruling class. During the 20th century, the world's first constitutionally socialist state was in Russia in 1917. In 1922, it joined other former territories of the empire to become the Union of Soviet Socialist Republics (USSR). After World War II, the Soviet Army occupied much of Eastern Europe and thus helped establish Communist states in these countries. Most Communist states in Eastern Europe were allied with the Soviet Union, except for Yugoslavia which declared itself non-aligned. In 1949, after a war against Japanese occupation and a civil war resulting in a Communist victory, the People's Republic of China (PRC) was established. Communist states were also established in Cambodia, Cuba, Laos and Vietnam. A Communist state was established in North Korea, although it later adopted its own ideology called Juche. In 1989, the Communist states in Eastern Europe collapsed under public pressure during a wave of non-violent movements which led to the dissolution of the Soviet Union in 1991. Today, the existing Communist states in the world are in China, Cuba, Laos and Vietnam. These Communist states often do not claim to have achieved socialism or communism in their countries—rather, they claim to be building and working toward the establishment of socialism in their countries. For example, the preamble to the Socialist Republic of Vietnam's Constitution states that Vietnam only entered a transition stage between capitalism and socialism after the country was re-unified under the Communist Party in 1976 and the 1992 Constitution of the Republic of Cuba states that the role of the Communist Party is to "guide the common effort toward the goals and construction of socialism". Communist states share similar institutions, which are organized on the premise that the Communist party is a vanguard of the proletariat and represents the long-term interests of the people. The doctrine of democratic centralism, which was developed by Vladimir Lenin as a set of principles to be used in the internal affairs of the Communist party, is extended to society at large. According to democratic centralism, all leaders must be elected by the people and all proposals must be debated openly, but once a decision has been reached all people have a duty to obey that decision and all debate should end. When used within a political party, democratic centralism is meant to prevent factionalism and splits. When applied to an entire state, democratic centralism creates a one-party system. The constitutions of most Communist states describe their political system as a form of democracy. They thus recognize the sovereignty of the people as embodied in a series of representative parliamentary institutions. Such states do not have a separation of powers and instead have one national legislative body (such as the Supreme Soviet in the Soviet Union) which is considered the highest organ of state power and which is legally superior to the executive and judicial branches of government. Such national legislative politics in Communist states often have a similar structure to the parliaments that exist in liberal republics, with two significant differences: first, the deputies elected to these national legislative bodies are not expected to represent the interests of any particular constituency, but the long-term interests of the people as a whole; and second, against Marx's advice, the legislative bodies of Communist states are not in permanent session. Rather, they convene once or several times per year in sessions which usually last only a few days. When the national legislative body is not in session, its powers are transferred to a smaller council (often called a presidium) which combines legislative and executive power and in some Communist states (such as the Soviet Union before 1990), acts as a collective head of state. In some systems, the presidium is composed of important Communist party members who vote the resolutions of the Communist party into law. A feature of Communist states is the existence of numerous state-sponsored social organizations (trade unions, youth organizations, women's organizations, associations of teachers, writers, journalists and other professionals, consumer cooperatives, sports clubs and so on) which are integrated into the political system. In Communist states, the social organizations are expected to promote social unity and cohesion, to serve as a link between the government and society and to provide a forum for recruitment of new Communist party members. Historically, the political organization of many socialist states has been dominated by a one-party monopoly. Some Communist governments, such as those in China, East Germany or Czechoslovakia, have or had more than one political party, but all minor parties are or were required to follow the leadership of the Communist party. In Communist states, the government may not tolerate criticism of policies that have already been implemented in the past or are being implemented in the present. Nevertheless, Communist parties have won elections and governed in the context of multi-party democracies without seeking to establish a one-party state and therefore these entities do not fall under the definition of Communist state. Examples include San Marino, Nicaragua (1979–1990), Moldova, Nepal (presently), Cyprus and the Indian states of Kerala, West Bengal and Tripura. Countries such as the Soviet Union and China were criticized by Western authors and organisations on the basis of a lack of multi-party Western democracy, in addition to several other areas where socialist society and Western societies differed. For instance, socialist societies were commonly characterised by state ownership or social ownership of the means of production either through administration through party organisations, democratically elected councils and communes and co-operative structures—in opposition to the liberal democratic capitalist free market paradigm of management, ownership and control by corporations and private individuals. Communist states have also been criticised for the influence and outreach of their respective ruling parties on society, in addition to lack of recognition for some Western legal rights and liberties  such as the right to ownership of private property and the restriction of the right to free speech. Soviet advocates and socialists responded to these criticisms by highlighting the ideological differences in the concept of "freedom". McFarland and Ageyev noted that "Marxist–Leninist norms disparaged laissez-faire individualism (as when housing is determined by one's ability to pay), also [condemning] wide variations in personal wealth as the West has not. Instead, Soviet ideals emphasized equality—free education and medical care, little disparity in housing or salaries, and so forth". When asked to comment on the claim that former citizens of Communist states enjoy increased freedoms, Heinz Kessler, former East German Minister of National Defence, replied: "Millions of people in Eastern Europe are now free from employment, free from safe streets, free from health care, free from social security". The early economic development policies of Communist states have been criticised for focusing primarily on the development of heavy industry. In his critique of states run under Marxist–Leninist ideology, economist Michael Ellman of the University of Amsterdam notes that such states compared favorably with Western states in some health indicators such as infant mortality and life expectancy. Similarly, Amartya Sen's own analysis of international comparisons of life expectancy found that several Marxist–Leninist states made significant gains and commented "one thought that is bound to occur is that communism is good for poverty removal". The dissolution of the Soviet Union was followed by a rapid increase in poverty, crime, corruption, unemployment, homelessness, rates of disease and income inequality, along with decreases in calorie intake, life expectancy, adult literacy and income. The following countries are one-party states in which the institutions of the ruling Communist party and the state have become intertwined. They are generally adherents of Marxism–Leninism in particular. They are listed here together with the year of their founding and their respective ruling parties. There are multi-party states with Communist parties leading the government. Such states are not considered to be Communist states as the countries themselves allow for multiple parties and do not provide a constitutional role for their Communist parties. Nepal: the Nepal Communist Party is the current ruling party of the central government. India: the Communist Party of India (Marxist) is the leading party in the state government in the southern state of Kerala. Brazil: the Communist Party of Brazil is the leading party in the state government in the northern state of Maranhão. Russia: the Communist Party of the Russian Federation is the leading party in the regional governments of the Irkutsk Oblast and the Oryol Oblast. San Marino (1945–1957), Moldova (2001–2009), Cyprus (2001–2013) and Guyana (1992–2015) have also had officially Communist ruling parties. 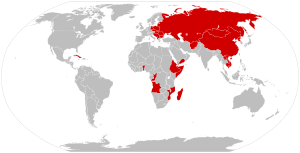 Wikimedia Commons has media related to Communist countries. ^ Busky, Donald F. (20 July 2000). Democratic Socialism: A Global Survey. Praeger. p. 9. ISBN 978-0275968861. In a modern sense of the word, communism refers to the ideology of Marxism-Leninism. ^ Wilczynski, J. (2008). The Economics of Socialism after World War Two: 1945-1990. Aldine Transaction. p. 21. ISBN 978-0202362281. Contrary to Western usage, these countries describe themselves as 'Socialist' (not 'Communist'). The second stage (Marx's 'higher phase'), or 'Communism' is to be marked by an age of plenty, distribution according to needs (not work), the absence of money and the market mechanism, the disappearance of the last vestiges of capitalism and the ultimate 'whithering away' of the State. ^ Steele, David Ramsay (September 1999). From Marx to Mises: Post Capitalist Society and the Challenge of Economic Calculation. Open Court. p. 45. ISBN 978-0875484495. Among Western journalists the term 'Communist' came to refer exclusively to regimes and movements associated with the Communist International and its offspring: regimes which insisted that they were not communist but socialist, and movements which were barely communist in any sense at all. ^ Rosser, Mariana V. and J Barkley Jr. (23 July 2003). Comparative Economics in a Transforming World Economy. MIT Press. p. 14. ISBN 978-0262182348. Ironically, the ideological father of communism, Karl Marx, claimed that communism entailed the withering away of the state. The dictatorship of the proletariat was to be a strictly temporary phenomenon. Well aware of this, the Soviet Communists never claimed to have achieved communism, always labeling their own system socialist rather than communist and viewing their system as in transition to communism. ^ Williams, Raymond (1983). "Socialism". Keywords: A vocabulary of culture and society, revised edition. Oxford University Press. p. 289. ISBN 978-0-19-520469-8. The decisive distinction between socialist and communist, as in one sense these terms are now ordinarily used, came with the renaming, in 1918, of the Russian Social-Democratic Labour Party (Bolsheviks) as the All-Russian Communist Party (Bolsheviks). From that time on, a distinction of socialist from communist, often with supporting definitions such as social democrat or democratic socialist, became widely current, although it is significant that all communist parties, in line with earlier usage, continued to describe themselves as socialist and dedicated to socialism. ^ "VN Embassy - Constitution of 1992". Archived 9 July 2011 at the Wayback Machine Full Text. From the Preamble: "On 2 July 1976, the National Assembly of reunified Vietnam decided to change the country's name to the Socialist Republic of Vietnam; the country entered a period of transition to socialism, strove for national construction, and unyieldingly defended its frontiers while fulfilling its internationalist duty". ^ "Cubanet - Constitution of the Republic of Cuba, 1992". Archived 9 July 2011 at the Wayback Machine Full Text. From Article 5: "The Communist Party of Cuba, a follower of Martí's ideas and of Marxism-Leninism, and the organized vanguard of the Cuban nation, is the highest leading force of society and of the state, which organizes and guides the common effort toward the goals of the construction of socialism and the progress toward a communist society". ^ a b Furtak, Robert K. The political systems of the socialist states, St. Martin's Press, New York, 1986, pp. 8–9. ^ Furtak, Robert K. The political systems of the socialist states, St. Martin's Press, New York, 1986, p. 12. ^ Furtak, Robert K. The political systems of the socialist states, St. Martin's Press, New York, 1987, p. 13. ^ Furtak, Robert K. The political systems of the socialist states, St. Martin's Press, New York, 1986, p. 14. ^ Furtak, Robert K. The political systems of the socialist states, St. Martin's Press, New York, 1986, p. 16–17. ^ Furtak, Robert K. The political systems of the socialist states, St. Martin's Press, New York, 1986, p. 18–19. ^ Kinzer, Stephen (15 January 1987). "NICARAGUA'S COMMUNIST PARTY SHIFTS TO OPPOSITION". The New York Times. ^ "Cyprus elects its first communist president", The Guardian, 25 February 2008. ^ SP, Huntington (1970). Authoritarian politics in modern society: the dynamics of established one-party systems. Basic Books (AZ). ^ Lowy, Michael (1986). "Mass organization, party, and state: Democracy in the transition to socialism". Transition and Development: Problems of Third World Socialism (94): 264. ^ Amandae, Sonja (2003). Rationalizing capitalist democracy: The cold war origins of rational choice liberalism. University of Chicago Press. ^ "Assemblée parlementaire du Conseil de l'Europe". coe.int. ^ McFarland, Sam; Ageyev, Vladimir; Abalakina-Paap, Marina (1992). "Authoritarianism in the former Soviet Union". Journal of Personality and Social Psychology. 63 (6): 1004–1010. CiteSeerX 10.1.1.397.4546. doi:10.1037/0022-3514.63.6.1004. ^ Parenti, Michael (1997). Blackshirts and reds : rational fascism and the overthrow of communism. San Francisco: City Lights Books. p. 118. ISBN 978-0-87286-330-9. ^ Michael Ellman. Socialist Planning. Cambridge University Press. 2014. ISBN 1107427320. p. 372. ^ Richard G. Wilkinson. Unhealthy Societies: The Afflictions of Inequality. Routledge. November 1996. ISBN 0415092353. p. 122. ^ McAaley, Alastair. Russia and the Baltics: Poverty and Poverty Research in a Changing World. Archived from the original on 23 January 2017. Retrieved 18 July 2016. ^ "An epidemic of street kids overwhelms Russian cities". The Globe and Mail. Retrieved 17 July 2016. ^ Targ, Harry (2006). Challenging Late Capitalism, Neoliberal Globalization, & Militarism. ^ Theodore P. Gerber & Michael Hout, "More Shock than Therapy: Market Transition, Employment, and Income in Russia, 1991–1995", AJS Volume 104 Number 1 (July 1998): 1–50. ^ Volkov, Vladimir. "The bitter legacy of Boris Yeltsin (1931-2007)". ^ "Cops for hire". The Economist. 2010. Retrieved 4 December 2015. ^ "Corruption Perceptions Index 2014". Transparency International. Retrieved 18 July 2016. ^ Hardt, John (2003). Russia's Uncertain Economic Future: With a Comprehensive Subject Index. M. E Sharpe. p. 481. ^ Alexander, Catharine; Buchil, Victor; Humphrey, Caroline (12 September 2007). Urban Life in Post-Soviet Asia. CRC Press. ^ Smorodinskaya. Encyclopaedia of Contemporary Russian. Routledge. ^ Galazkaa, Artur (2000). "Implications of the Diphtheria Epidemic in the Former Soviet Union for Immunization Programs". Journal of Infectious Diseases. 181: 244–248. doi:10.1086/315570. PMID 10657222. ^ Shubnikov, Eugene. "Non-communicable Diseases and Former Soviet Union countries". Retrieved 18 July 2016. ^ Wharton, Melinda; Vitek, Charles (1998). "Diphtheria in the Former Soviet Union: Reemergence of a Pandemic Disease". Emerging Infectious Diseases. 4 (4): 539–550. doi:10.3201/eid0404.980404. PMID 9866730. Retrieved 18 July 2016. ^ Hoepller, C (2011). "Russian Demographics: The Role of the Collapse of the Soviet Union". Undergraduate Research Journal for the Human Sciences. 10 (1). ^ Poland, Marshall. "Russian Economy in the Aftermath of the Collapse of the Soviet Union". Retrieved 18 July 2016. ^ The World Factbook: "FIELD LISTING :: GOVERNMENT TYPE". ^ cahoon, ben. "German States since 1918". worldstatesmen.org.